Nuestro pequeño complejo de apartamentos ha sido recientemente renovado con ascensores y una piscina comunitaria climatizada privada. Este apartamento de un dormitorio con acceso a Internet está cómodamente equipado para dormir y atender a tres personas, con una gran terraza soleada (35 m²). El pequeño complejo se compone de cuarenta apartamentos, al final de un callejón sin salida tranquilo y aislado, aunque solo unos pocos minutos realistas dan un paseo hasta la playa local y el centro del pueblo. 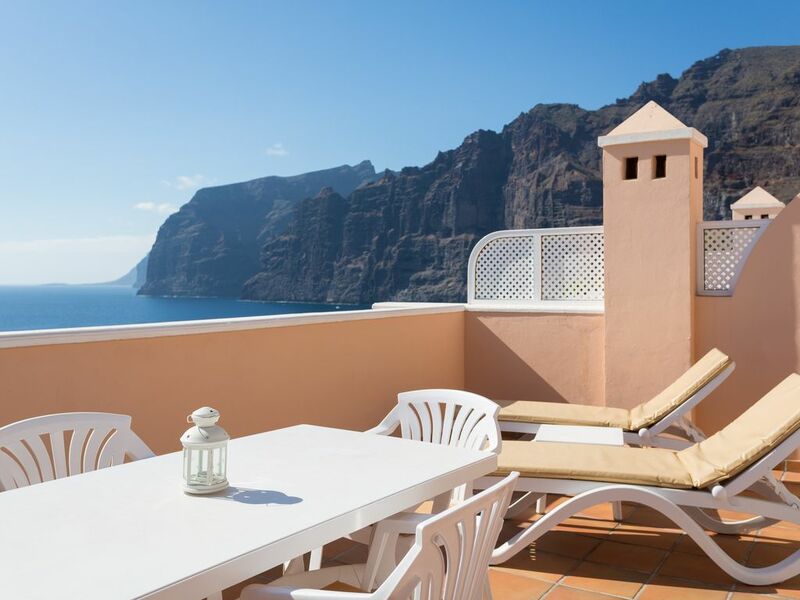 Las vistas panorámicas únicas desde la terraza de los famosos acantilados, el puerto pesquero y al otro lado del Atlántico hasta las islas de La Gomera y La Palma son realmente impresionantes. ¡Si aprecia los paisajes fantásticos, los atardeceres y las veladas con velas en la terraza con una copa de vino! ¡Este es el lugar para ti! Aire acondicionado disponible bajo petición y durante los meses de verano. This was our 3rd holiday in Los Gigantes, our first was 26yrs ago--we loved it so much we returned the following year for our sliver wedding anniv. Now (25yrs later) for our golden anniv. we found it the same but bigger, we immediatly discovered favorite shops & resturants still where we left them plus a lot more. The only down side was the terrain, hills are much steeper at our age but a friendly car hire firm solved that problem. Our dealings with Santiago del Teide, Lesley & Francisco were reliable & friendly (I must thank Lesley for her recomendation of El Mar services for transfer, they were reasonable & reliable. it gives you a lift to find everything in place when you arrive, they turned up dead on time for return transfer after 2 weeks holiday, I firmly recomend them to anyone needing transfer (airport - resort & return). Prima locatie, mooi balkon met zeezicht. Schoon! EN EEN LEUK ZWEMBAD. Excellent apartment, everything you need is there, balcony, pool, views, wi-fi, short walk to all bars and restaurants, already planning our return. Booking was easy, information from Lesley was great, and happy to help! We have loved everything about staying at this apartment, and we have no complaints at all. Everything was exactly as described (although the view is even more beautiful in real life). We would come back anytime! Well equipped clean property with amazing views. Beds comfy.